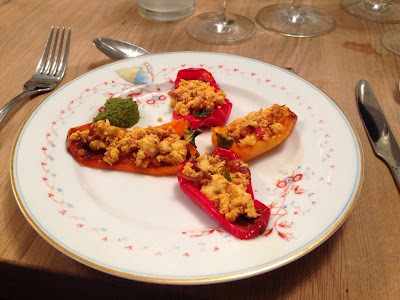 In December I was fortunate to be able to go to the very first Franglais Kitchen supperclub in Cambridge, hosted by Nazima and her husband Pierre, in their home. 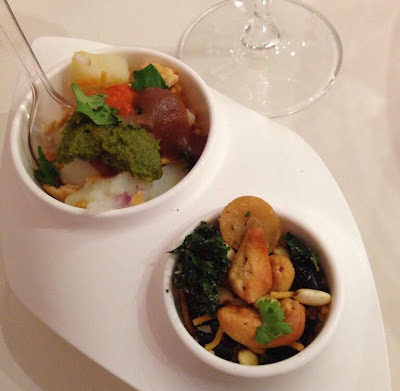 The theme was Indian French Fusion to bring together the couple’s roots – think of classic French cooking techniques but with spice and inspired by popular Indian streetfood dishes. We started off with a glass of a French 75 cocktail – gin, sugar syrup and lemon topped off with Prosecco – perfect with the accompanying appetisers of bhel puri, pani puri and homemade Bombay mix. Bhel puri is one of my favorite Indian snacks – a mixture of small chickpea noodles ‘sev’, puffed rice, potato, onion topped off with tamarind chutney and green chilli chutney. Find my recipe here. A plate of pani puri was also laid out, another classic Indian street food, they are little puffed shells which filled with either potato or chickpea and onion before being topped with a chilled spiced ‘pani’ (water) which you fill the puri with, and then pop the whole thing in your mouth and crunch! Nazima’s were just as they should be, a nice hit of chilli with refreshing pani and soft filling. After the treat of the appetisers we moved to the mains. I went for a vegetarian main, mini peppers stuffed with homemade paneer served with chilli chutney. I’ve never had homemade paneer before, it’s a lot different to shop bought, crumbly and tender and it takes on spices really well. After this we had a soup course, a spiced ‘haleem’ stew made with squash – comforting and something a little different. The soup was served with gorgeous sourdough naans, cooked on a barbecue, spiced with cumin – the idea of a sourdough naan is something I’ve never come across before and I definitely want to try making it. 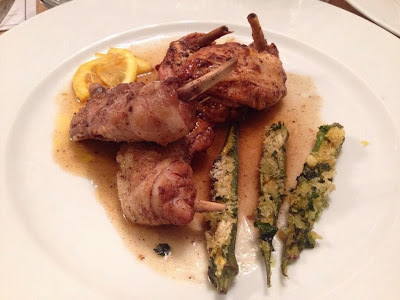 Next was the main course, spiced poussin with stuffed okra. This was more French in style but made different by the spicing. Nazima also passed around a jar of her homemade achar, mango pickle to go alongside. Puddings, three of them! 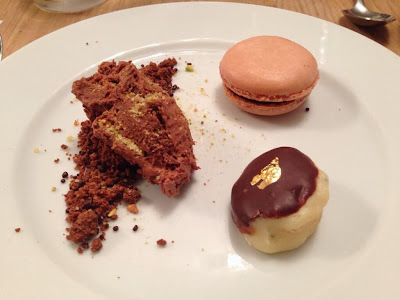 A delicately spiced masala chai chocolate mousse with popping candy, chocolate burfi (sweet) and a chilli chocolate macaron. A choice of puddings is always welcome and we all enjoyed working our way through each element of the last course. Nazima and Pierre are holding another supperclub on the 31st January, this time featuring the cuisines of France and Indonesia. You can find out more and book here, not one to miss! Wow, what an incredible meal. I sense a lot of love (and work) went into these recipes.